Gothichamlet of Cowbutt Crunchies Cosplay created this tutorial for our third round of the TranspART Competition. 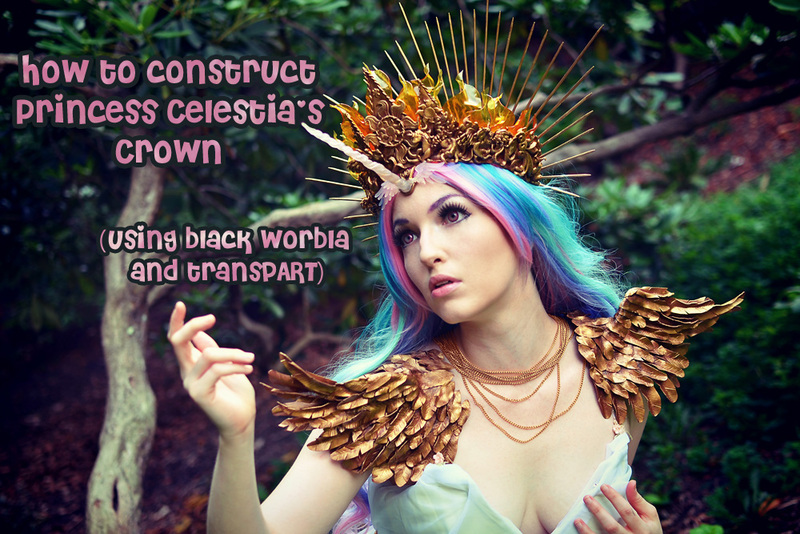 In this tutorial we’ll be creating a crown primarily using Black Worbla and transpART, inspired by My Little Pony’s Princess Celestia! 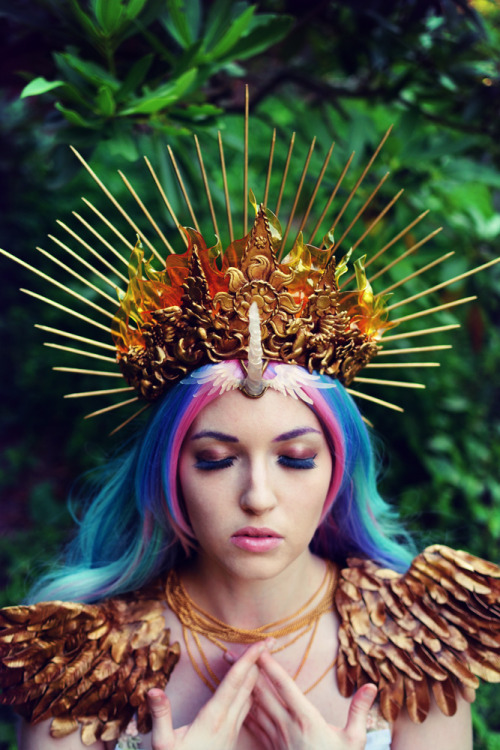 This sun-themed headpiece involves several components and has been broken into several parts for easy reading: 1) the base crown and sculpture motifs 2) the sun “halo, 3) painting and priming, 4) semi-transparent sunbursts, and finally 5) the horn. Keep reading to create your own crown! 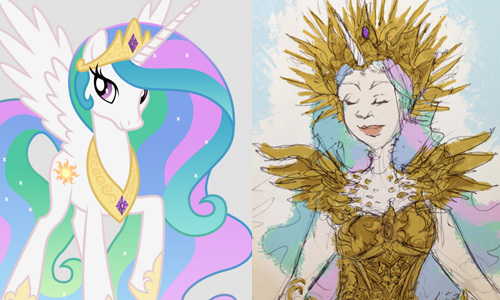 The design I chose for Celestia is heavily sun-influenced, and also involves many baroque-styled “sculptures” for a regal look. However no matter how you decorate your crown, you will want to begin with a solid base. 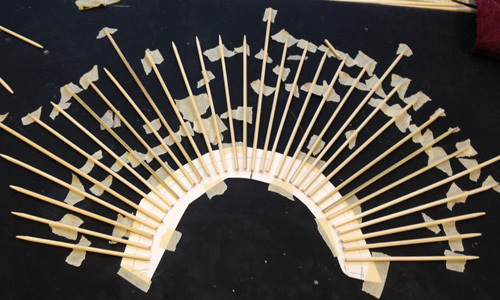 1) Begin by drafting a test version of your tiara from poster board to gage the size and fit. Don’t forget to fit this template on top of your wig, since it will alter the size of your head! 2) Trace your draft onto your worbla and cut out a worbla version of the base. 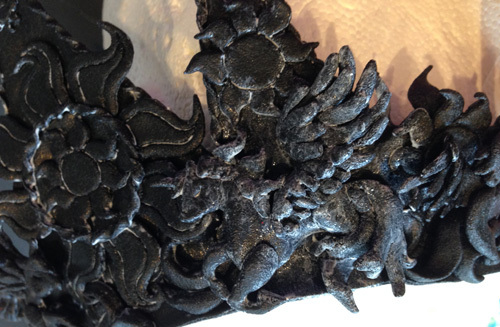 If you are heavily decorating in motifs, a single layer of worbla should be fine, but if gaps will be showing you may wish to double up your worbla for strength. 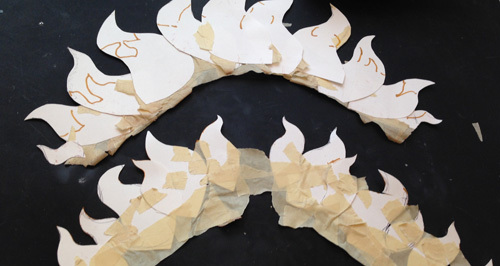 Cut the side edges into a raggedy, flame-like pattern, and pinch each flame slightly to give it additional dimension. 3) Trace a second worbla draft, but leave this at half the height. Cut the entire top into a flame pattern, pinching these like in step 2. With the worbla still heated, lay it over your larger base piece, matching the bottom edges together. 4) Heat the entire piece very lightly and bend it into shape to fit your head, over your wig. Hold in shape until it cools. With your base out of the way, it’s time to move on to creating the decorative sculptures. 1) Don your heat proof gloves, heat a pile of worbla scraps with your heat gun, and then kneed them together to create one solid, very thick piece. If your worbla is at a hot enough temperature, you should easily be able to kneed the worbla like playdough to smooth out any folded lines. You do not necessarily have to use a piece this thick, but I wanted more of a sculptural look to my crown, rather than a flat one. Also, the thicker your worbla is, the more freedom you will have to press lines and add dimension later. Sketch the largest “base” part of your sculpture and trace this onto the worbla – for me this was the head and body of my horse. 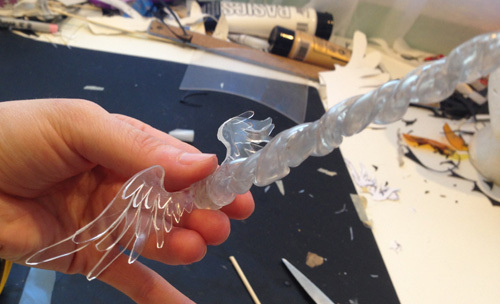 Heat your worbla slightly and then cut your shape – making the worbla pliable will really help with any tight curves. 2) Use a sculpting tool and trace along any hard lines. Try pressing down with the tool or your finger on one side of the line to add even more dimension (for instance, giving a “pop” to my horse head above). While still heated, prod any raw, jagged edges with your fingers to smooth them out. 3) Take a new piece of doubled or tripled kneaded worbla, and cut out any additional pieces for your relief. For my horse, this included strands of hair, legs, and wing base. Heat up the tip of your new piece where it will connect to the larger base and press them together to form a bond. If possible, heat the base piece as well for a stronger hold. 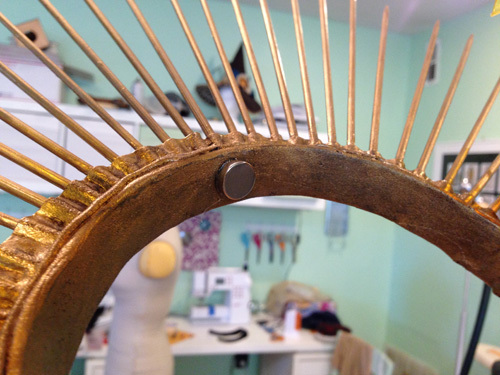 Once connected, mold or sculpt your top piece into your position. 1) Cut two piece of worbla, heat, and press together. 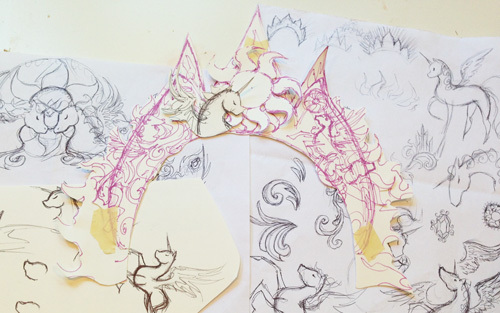 Sketch your design and trace it onto your double thick worbla piece. Heat it slightly and then cut the shape out, smoothing out any jagged edges with your fingers before it’s cool. 2) Re-heat the top of your worbla slightly and use a sculpting tool to gently carve out any decorative lines. 3) If you have a complicated shape like my large sun design, repeat steps 1 and 2 to cut out any smaller shapes that should be positioned on top of your base. Heat both pieces and then lightly press the smaller shape over the base to bond them together. Allow them to cool. 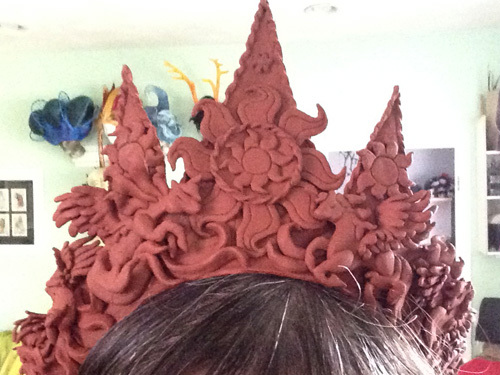 Once all of your reliefs are sculpted, it’s time to attach them to your tiara! 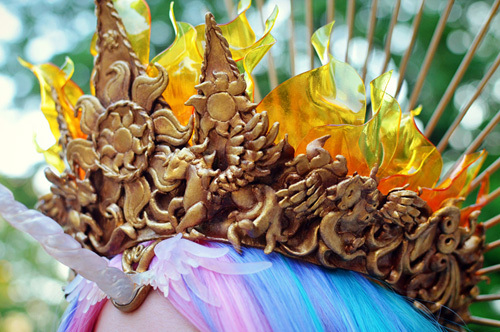 1) Heat the area of your tiara where you plan on attaching your first sculptures. Simultaneously, heat the back of your relief. Don’t overdo it or you may lose the relief’s fine details – most of the heat can be focused on the tiara itself. 2) Press the relief into the tiara. If layering sculptures, press in your first relief, add a little more heat, then press in the relief that is positioned over it. 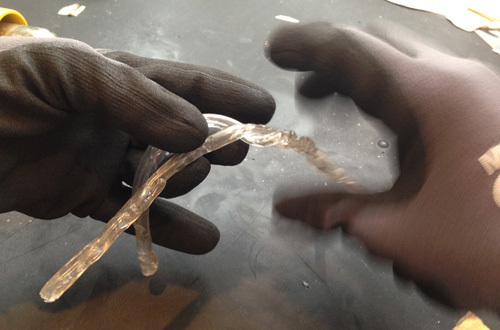 Remember, go slow and heat up one crown area at a time to prevent bending the base too much. 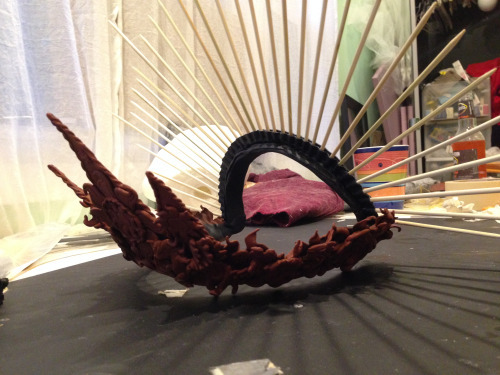 3) Once all of your sculptures are attached, test the fit of your crown again. If it’s lost its shape slightly, heat the back of your crown and hold the crown against your head in the right position until it’s cooled. We’re going to cheat a little by using BBQ skewers for the Madonna-halo tines. While technically possible to use worbla, I found it fairly difficult to get a straight, thin enough shape. Just be aware that wood /is/ breakable so be gentle, and if sturdiness is a concern, consider coating your skewers in a thin layer of resin. 1) Place the crown on your head over your wig and measure from back tip to back tip, over the top of your head. 2) Heat a piece of black worbla, and quadruple fold it together. You can also just mash a bunch of scraps into a thicker piece. Cut it to measure the length of your head measurement by about ¾ths an inch wide. 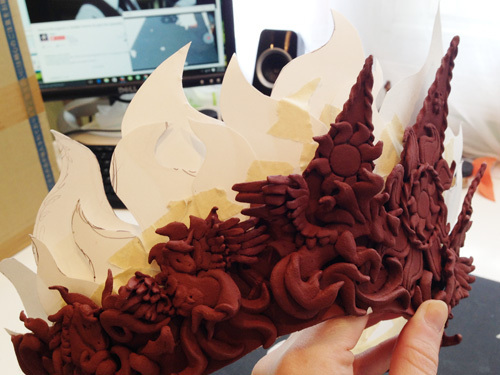 Heat this piece slightly and then – with the worbla touching the edges of your crown – lay it against the curve of your head. Allow to cool and you should now have the shape of your tine base. 3) Take your skewers, and using your scissors/tin snips, snip a few millimeters off the pointed tip. Sand this tip with a few strokes of sandpaper until it’s still pointed, but blunt enough to rub your thumb over. This step may seem irrelevant, but it’s important to reduce accidental snags and pulls, since a super-sharp skewer tends to catch on any nearby fabric or wigs. 4) Measure your skewers and cut 32 of them to 6″ including the point. Cut the remaining 5 to 7.75″. 5) I found it easiest to arrange the tines when I had a template to go off of. Trace your tine base onto a sliver of cardboard. Begin laying your tines in a radial circle out from that base outline. You can arrange these however you’d like, but I personally liked spacing the big tines out 2″ from each other, with five smaller tines in between. To save yourself a lot of headache, tape each tine down to your workspace, avoiding taping over the template. 6) Lay your curved base over a fresh piece of worbla and trace the shape. Widen the width slightly so that you’re left with a semicircle that’s around an inch thick. Repeat this a second time and cut both semicircular shapes out. Eventually these two pieces will form a stability layer that keeps the tines tightly in place and clamped to the flat base. 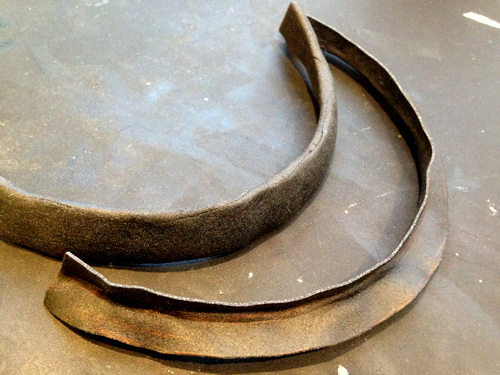 7) Heat your first semicircle and then fold the bottom half upward so that the worbla forms an “L” all the way around. Lay the worbla over your tines so that the bend in the worbla is flush with the bottom of the skewers (you don’t want them sticking out into the open too much). Heat a little more until the worbla is pliable and then begin pressing the worbla down around the skewers for a snug fit. I found that using a spare skewer to push the space in between each stick worked great. 8) Allow to cool completely and then flip the whole thing over. Your tines should be pretty secure at this point, but be careful nonetheless. Repeat step 7 for your unused semicircle by first folding it into that “L” shape. Then, lay it over both the tines and the bottom worbla layer so that you fuse both semicircles together and create a snug fit. 9) Heat the bottom of your tine contraption where the two “L” shape flaps are exposed. You may also heat your base slightly if you wish, but I did not heat it particularly much, since I didn’t want to risk losing my head imprint shape. Spread the flaps out and place the flaps flush against your worbla base, with the BBQ skewers along the base’s center. Generously press the flaps against the base worbla and allow to cool. 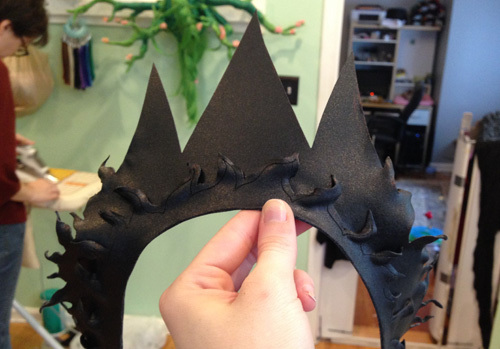 10) Heat the ends of your worbla base as well as your crown edges. Press these edges together to fuse the tine base to your crown. If you’re paranoid like me, you can also mush together a big old wob of worbla heated to a high heat, and then press it into the juncture for added security. 11) Didn’t add enough tines? No problem! Mush together a wob of worbla, heat it severely, and then stick it to the edge of your crown before inserting a tine straight into the plastic. Just be sure to press the worbla in around the tine hole to hold it securely in place. Before moving on to the transpART, it’s time to prime and paint! 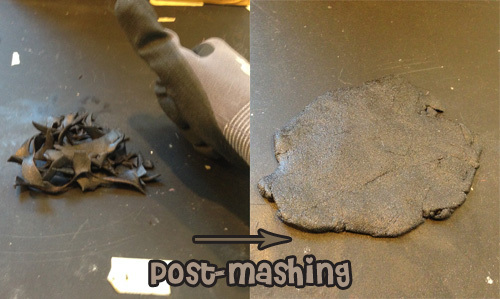 Priming is an important step in any worbla project, as even black worbla tends to have a slightly gritty texture. To get rid of this, there are a host of different primers you can use, from gesso to wood glue to Flexbond to Plastidip. Because our crown still has the ability to flex slightly, we want to use a primer that will not crack under strain. 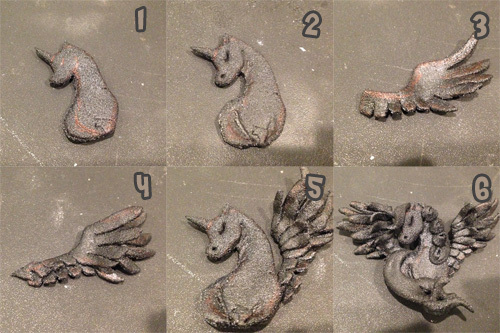 My pal Kidbunni has a great rundown of primers and their flexibility at http://kidbunni.tumblr.com/post/143657850128/worbla-tutorial-part-1-primer and you can also find some primer comparisons here on Worbla’s own website. I decided to go with Flexbond partially because I was curious about how it would shape up, and also because I knew that sanding this crown would be very difficult because of all the tight edges, which eliminates a big advantage of spray gesso. 1) Pour a little of your Flexbond out and select a relatively small-medium sized brush. I’ve read guides where folks preferred to use a damp brush with their Flexbond, but to be honest this did not work out great for me, possibly because I was working with such small shapes. Any added water just made the Flexbond too watery to use efficiently. Instead I simply dipped my brush in and began painting the glue on. 2) Take care to sweep and thin out any pools of glue – you want a thin, even coat with minimal brush strokes. Work fast and keep to a concentrated space. While the glue is still wet you can easily thin it out to make an even coat, but if you try to go back to that spot after a few minutes you’re just going to make any strokes more obvious. 3) Allow to dry completely and then repeat steps 1-2 until you are satisfied with the finish. 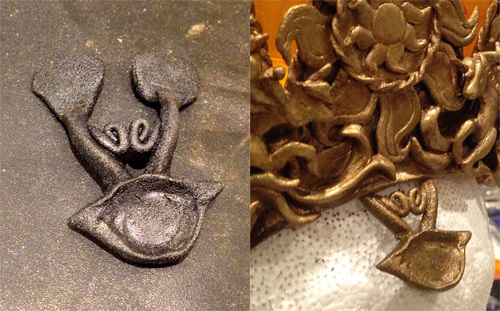 Black worbla can be primed in as little as two coats, but I used four just because I wanted an ultra smooth finish. 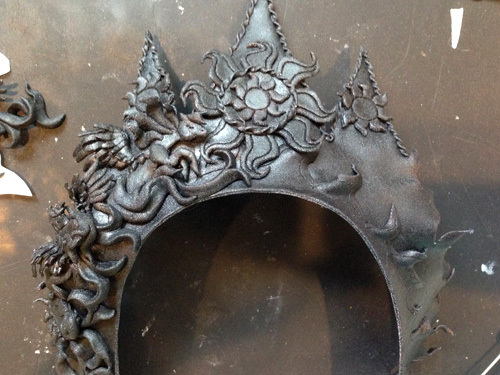 4) With your prime layer dry, spray your crown with a brown spraypaint or primer. Acrylic paint works too. The brown layer is important as it will give a warm undertone to our gold finish. 5) For the gold layer I used Amaco Brush and Leaf in antique gold. This stuff is AWESOME – it’s a lacquer so it’s extremely opaque and shows very few brush strokes; just be sure to ventilate your area while using it. Allow your first layer to dry then add a second. If using acrylic paint you may need to use a third layer. 6) Weather your gold by drybrushing very small amounts of brown and brown mixed with black into the deeper grooves and recesses of your sculptures. Adding a darker color behind the motifs will help the color pop. 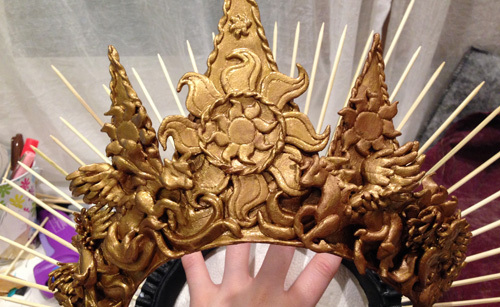 Adding transpART to the crown helps really drive home the sun theme and gives a really cool textural contrast! 1) Begin with a poster board mock up and cut out various sunburst shapes. Keep each piece to a single point to keep it looking more like a sun and less like fire. 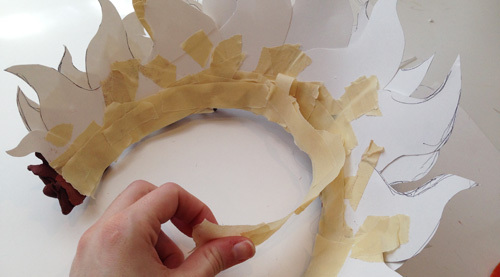 Tape your pieces together and arrange them behind the tiara until you like the shape. Trim off any excess poster board. 2) Remove your taped-together poster board pieces. If you layered pieces over each other like I did, add a few more pieces of tape so you can keep the front layer together and separate it from the back row. You will be cutting these two pieces out separately. 3) Use a sharpie to trace your patterns onto the transpART. Cut your shapes out. 4) Bring a pot of iDye yellow poly (without the intensifier) to below boiling (make sure this is poly and not natural or your pieces will not dye!). It is always important to boil dye in a pot you do not use for cooking, in a well ventilated area and away from any pets or children. One at a time, drop your transpART pieces in the dye and allow to boil for 7-10 minutes. A pair of non-food tongs works great for working with the transpART, as it’s a good idea to occasionally move your piece around to make sure that your points do not accidently fold and stick to each other for a long period of time. It is fine if the pieces stick a little as they’ll separate right away once cool, but do not allow the transpART to remain in a hard fold for a long period of time, or the dye may get caught in that folded area. 5) Remove your transpART and rinse under cool water. Your shape probably looks pretty floppy right now, but don’t worry! 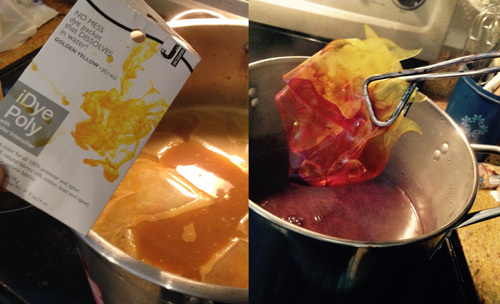 Next, bring your pot of red or orange iDye poly to a boil. (Why orange OR red? Without the intensifier your transpART will only turn orange, even in a red dye bath) This time however, grip your transpART with your tongs and lower the bottom half of the flames into the dye. I did this by rolling the piece together so that I could grip all of the points with my tongs. Continuously raise and lower your flames, taking care to soak the bottom third at all times, while keeping the next third or so only sometimes submerged. This constant movement will help create a gradient ombre effect, rather than a hard line where the orange color stops. The top third should remain completely untouched and will stay a bright yellow color. Once finished, remove and rinse. 6) Lay your crumpled transpART on your table and apply your heatgun until you can push the piece back into a flat shape. Allow to cool slightly and then heat just the tips of your sunbursts, using your fingers to twist the edges and tips slightly to give them a more three dimensional effect. Once cool, apply superglue to the bottom inch or so of your larger sunburst piece, all along the bottom edge. When gluing transpART, I find that applying a thin layer of glue to a large area works best – oversaturating will mean that the glue takes longer to set. 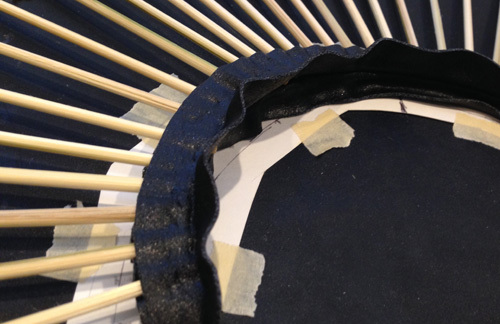 Align your top and bottom sunburst layers along the bottom and hold into place until the glue dries. 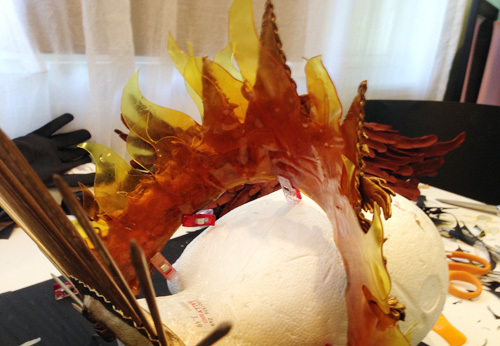 7) Apply your superglue along the inside base of your worbla where the flames will lay. Hold the transpART piece against the glue and hold in place for several minutes until it’s dry. 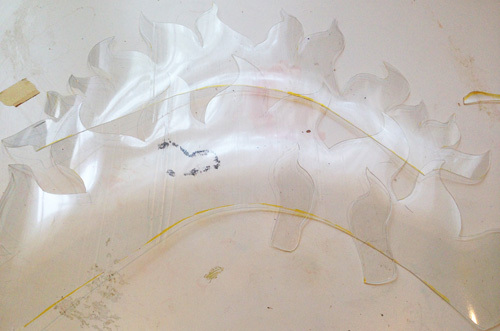 1) Decide how long you would like your horn and cut out two triangular pieces of transpART to that length. My pieces were approximately 6.5 inches long by .75 inches wide on the widest side. 2) Put your gloves on! To heat transpART to a moldable temperature the plastic must become very, very hot but loses that heat very, very quickly. It’s important to work fast and not let the heat impede you. When over-heating or getting it to a moldable temperature you will notice that the worbla takes on a cloudy look. This is fine but we do not want to over-damage it to the point where it’s completely opaque or contains bubbles. Try to aim for just hot enough to mold, but not so hot that it begins to cloud. Get your transpART to this magical temperature and begin to roll your first triangle back and forth. Apply more heat to maintain the temperature and roll some more until you have rolled it into a cone shape. Repeat for the second triangle. 3) Apply one more final burst of heat and then very quickly pinch the wider base of your triangles together. Twist them upward into a single spiral shape. 4) Apply heat directly to the base and tip so that you can smooth them into a solid, secure shape. 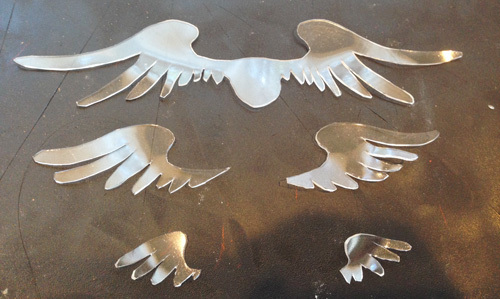 5) For the decorative wings, sketch a shape to your liking on poster board and then trace it onto the transpART. Cut three layers of feathers, each smaller than the last. Use a drop of superglue to affix the smallest feathers on top of the medium layer, and then that on top of the largest layer. Heat the center of your horn to a fairly hot temperature and then press it to the center of your wings – the heat will cause the two piece of transpART to bond. 6) Right now your transparent horn is looking pretty cool, but to add a shimmery, pearlescent finish, dip a dry paintbrush in your rose gold Pearl FX powder and liberally brush it on. Add a few strokes of gold powder near the base of the horn as well. Spray with Testor’s clear lacquer to set. 7) Create a “holder” for your horn by heating a circular, kneaded wad of worbla and pressing the horn directly into it to obtain the right shape. Trim off any excess, and use decorative rolled worbla pieces to bridge the gap between the holder and where you will attach it to the crown. I pressed down on the edges of my rolled pieces to make a wider surface area, which will help when gluing. Prime and paint following the steps you took in the priming/painting section. 8) Apply a thin layer of superglue to the flat part of the rolled pieces and press to the inside base of the crown. Apply a layer to the bottom of the horn and hold against the base until dry. While the crown should be well balanced on its own, for extra security you can use a rare earth magnet to clamp it to your wig. This will not provide a huge amount of support but it should help ward off any sliding or small bumps. Take one half of your magnet set and generously apply your glue of choice. Press into the center of the base of your halo. To clamp it to your wig, just take the other magnet half and place it under your wig net. So long as you have aligned the polarity, your magnets should clamp together through the wig. Go be a fabulous horse!